Head to Monster Jam in Oklahoma City for two days of rip-roaring fun at the Chesapeake Energy Arena. 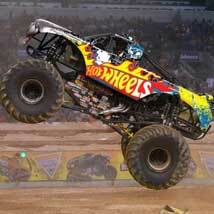 Monster Jam is an incredible family-friendly experience starring the biggest performers on four wheels. These 12-foot-tall, 10,000-pound machines will bring you to the edge of your seat as you watch them racing through a custom-designed track full of obstacles.